History of wrestling - Wrestling portal "Samson"
Wrestling arose in the period of a primitive-communal system. It arose as one of fixed assets of single combat of primitive people for the existence. The person had to defend the chosen ground, the rivers, the lakes, the caught bird or the killed animal. Later wrestling lost such narrow, utilitarian orientation and turned into a complex of intelligent technical actions, became original means of physical training. Wrestling has broad development in the period of a slaveholding system. Numerous monuments of that era testify to it, for example, the well-known Egyptian tomb in the settlement of Beni of Gassan (2600 BC) on which walls various receptions of wrestling are represented. Wrestling reached original development in Ancient Greece. Its began to use for education of the strong, dexterous, hardy and strong-willed person. Wrestling was included into system of physical training of children, young men and adults. Many of the most visible philosophers and poets, statesmen and commanders of Ancient Greece were in due time given wrestlers - participants and winners of the Olympic competitions (Krotonsky, Pythagoras, Platon, Pindar, Alkinad, etc.). The first Olympic Games in Ancient Greece took place in 776 B.C. and each four years without breaks for 1170 were spent. All wars for the period of Olympic Games stopped. It was called "sacredtruce".Wrestling in the Olympic Games was included for the first time in 704 BC from the XVIII Olympic Games. The Greek athlete Teseus created the first rules on wrestling. The one who three times will throw the rival on the earth won. Milan Kratonsky - sixfold chempionolimpiysky games was most known of the Greek wrestlers. Emergence of wrestling in Russia belongs to very far times. Historical chronicles testify that wrestling in Russia widely occurred in the X-th century AD. Owing to historical conditions Russians were compelled to wage frequent wars with attacking foreigners. Battles had nature of hand-to-hand fights where a crucial role played force, dexterity, endurance, fearlessness - the integral qualities of wrestling. In the history of our people cases when a question of that, to be or not to be to war are known, decided a duel of two soldiers - wrestlers. So in the Lavrentyevsky chronicle narrating about the next attack aims to Russia (993 g) it is told how the pechenezhsky prince suggested prince Vladimir to carry out a duel of two wrestlers instead of wrestling and to these to decide a war fate. Fight took place between a pechenezhsky giant and the Russian country guy who has been more strongly and more skillfully than the enemy soldier (he tore off it from the earth and I strangled hands). But wrestling found broad application in Russia not only in military science. Wrestling as the form of entertainment and force and courage manifestation, was very popular among the Russian people. The big place on all holidays and celebrations was allocated for it. About wrestling many proverbs, sayings, bylinas are put. The proverb "Without the wrestler is especially characteristic there is no wreath", showing that in ancient times our ancestors have any walk, games, people's assembly came to an end usually favourite, all dear, valiant entertainment. Official date of emergence of Greco-Roman wrestling in Russia it is considered to be 1895 and it is connected with names of figures V.F.Krayevskim and V.A.Pytlyasinskim's amateur sports. The first Greco-Roman wrestling championship of Russia was held in Petersburg in 1897. Eight wrestlers participated in it. Seven - from Petersburg, one - from Riga. Alexander Shmeling (Petersburg) became the first champion of Russia. Following 1898 the second superiority of the country among fans was played. But the rank of the champion of Russia wasn't awarded as fight between A.Shmelingom and G. Gakkenshmidtom ended in a draw. The third amateur championship of Russia took place in 1899. In the ending Shmeling and Gakkenshmidt again met. In the first fight between them the winner of the previous superiority was defined. On the 26th minute of a flawless victory Gakkenshmidt achieved. Later some days, fighters met again. Having defeated again Shmelinga, on the 46th minute Gakkenshmidt became the champion of Russia and in 1899. In these 3 amateur championships wrestling was carried out on circular system without division of participants into weight categories. Further before October Revolution of 1917 four more championships of Russia in 4 and 5 weight categories in 1913 and 1914 in Riga were held. In 1915 - in Petrograd and Moscow. In 1898 in Vienna (Austria) the first Greco-Roman wrestling European championship among fans took place. 11 athletes from 3 countries participated: Austria, Germany and Russia. Competitions took place without division into weight categories. The wrestler from Russia George Gakkenshmidt became the first champion of Europe. The Russian wrestlers came to the international Olympic scene in 1908. On the IV Olympic Games in London Nikolay Orlov (to 66 kg) and Alexander Petrov (heavy weight) for the first time won silver medals. Heavyweight Alexander Petrov conceded to Hungarian Richard Veyts who has become the Olympic champion, and Nikolay Orlov in more exactly fight lost easily weight to Italian Enrico Porro who has won a gold medal. On the V Olympic Games of 1912 the Russian fighter Martin Klein in the ending on points won against the world champion of 1911 Alfred Asikaynen Stockholm (Sweden) and won a silver medal. The meeting lasted 10 hours 15 minutes and became history of wrestling as an example of extraordinary endurance, will power and firmness. For the first place Klein had to fight against Swedish wrestler Yukhansson, but because of injury of a hand Klein refused fight and took the second place, and Edwin Yukhansson (Sweden) became the champion of Olympic Games to 75 kg. George Bauman (Petrograd) became the first world champion among fans from the Russian wrestlers of pre-revolutionary Russia. It won a gold medal in 1913 in to Breslavl (Germany) in weight category to 75 kg. In 1904 during rapid development of professional wrestling in Petrograd the first championship of Russia among professional wrestlers was held. 30 athletes participated in it, many wrestlers were invited from foreign countries. This championship on circular system proceeded the whole month. The greatest popularity was got to themselves by world famous Russian professional wrestlers Ivan Poddubny, Ivan Zaikin, Ivan Shemyakin, Clemens Boulle, Vladislav Pytlyasinsky, Ivan Spul, etc. 5 . Dmitry Gorin (Kiev) - heavy weight. the silver medal is handed over to Aram to Yaltaryan, bronze - to Vyacheslav Kozharskomu. Nikolay Belov was awarded by a special prize for the best equipment. The Soviet wrestlers with honor carried by a sports banner of the Homeland. Three champions of Europe took the second command place, having conceded only 2 points to a strong team of Sweden is a good result for debut. The silver medal awarded Shalva Chikhladze - to 87 kg. Bronze - Artem Teryan - 57 kg, Nikolay Belov - to 79 kg. Without a medal there was only one Simeon Marushkin who has taken the 4th place to 73 kg. The team surely won first place. The deserved trainer of the USSR of Kukhianidze Vakhtangmilitonovich headed a national team of the country. For all history of modern Olympic Games from 1896 to 1996 the Soviet and Russian athletes on Greco-Roman wrestling won 38 gold, 22 silver and 15 bronze medals. For comparison, on the second place on medals - the national team of Finland - 20 gold, 19 silver and 18 bronze. On the third - team of Sweden - 19 gold, 14 silver, 19 bronze. 34 Soviet and Russian outstanding athletes on Greco-Roman wrestling rose by the highest step of the Olympic podium. In the World Cup the Soviet wrestlers took part for the first time in 1953 in Naples (Italy). 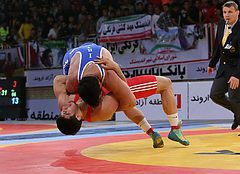 In competitions 208 wrestlers from 21 countries acted. The Soviet wrestlers won 5 gold, 1 silver and 1 bronze. The first world champions became: Boris Gurevich - 52 kg, Artem Teryan - 57 kg, Gurgen Shatvoryan - 73 kg, Givi Kartoziya - 79 kg, Augustus Englas - 87 kg. The silver medal awarded the Iokhanes Kotkas who has conceded in the ending to the Swede Benta Antonssona, Shazam Safin who has lost on points to the Finnish wrestler Lekhtonen got a bronze medal, and the well-known Swedish wrestler Gustaf Frey became the world champion. Surprise for all participants of competitions was defeat of the champion the XV Olympic Games. Jacob Punkin - he took only the fifth place. USSR national team came out on top in a team competition. For all history of performances in the World Cups the Soviet and Russian athletes on Greco-Roman wrestling from 1904 to 1999 won 154 gold, 56 silver and 34 bronze medals. On the second place - the national team of Hungary - 24 gold, 30 silver, 22 bronze; on the third - the national team of Finland - 21 gold, 18 silver, 23 bronze medals. The outstanding fighter of the present Aleksandr Karelin in the World Cups won 9 gold medals. Fivefold world champions became Valery Rezantsev, Nikolay Balboshin, Gogi Koguashvili, Victor Igumenov. On the international carpet wrestlers achieved such outstanding successes thanks to constant care of reserve preparation. For the first time the national youthful team on Greco-Roman wrestling till 18 years participated in the first World Cup of 1969 in Boulder (the USA, the State of Colorado). Our young team excellent acted and won 7 gold, 1 silver both 1 bronze medals and the first command place. The deserved trainers of the USSR Belov V. prepared young wrestlers for the first superiority of the world With, Kasparov E.B. Anfinogenov L.N. Maysuradze V. With, Vardanyan R. F. The national youth team till 20 years for the first time participated in the first World Cup in 1973 in Miami Scourge (USA). 4 gold, 4 silver and 1 bronze medals and 1 command place were won. The deserved trainer of the USSR Kolupov Yu.I. headed team. In July, 1998 in Moscow with great power took place Olympic the first world youthful games. Young wrestlers of 36 countries took part in competitions. The combined youthful team of Russia won seven gold medals from ten and the first command place. The known Moscow trainer, the deserved trainer of Russia of Sides Victor Andriyovych achieved big success in preparation of young winners. To three of his pupils - to Alexey Frolovskomu to 52 kg, to Alexey Krasavin to 69 kg, to heavyweight Alexander Chernichenko - handed over gold medals of champions. The deserved master of sports, the triple world champion, the champion of Olympic Games in Barcelona of 1992 Eskandarian Mnatsakan (Moscow) headed a combined youthful team of Russia. Outstanding wrestlers, Olympic champions Shazam Safin, Anatoly Kolesov, Shamil Hisamutdinov, Nikolay Balboshin, Alexander Kolchinsky, Mikhail Mamiashvili, Aleksandr Karelin and others grew from youthful and youth national teams. The deserved trainer of the USSR Belov V. S. "Greco-Roman wrestling. Lines from history"